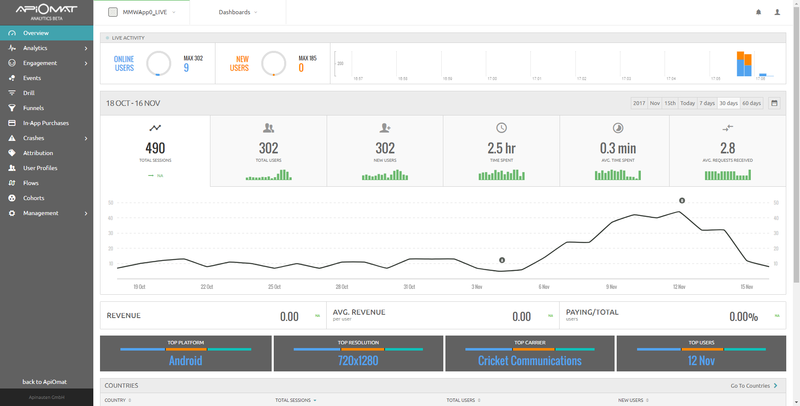 When a user logs into ApiOmat Analytics, they start on the Overview page shown below. Here the user can select the app they would like to view, set the time frame as well as create custom dashboards. To create a custom dashboard, click on Dashboards. If you haven't create any custom dashboards, then the only option will be to create a new dashboard. Once you have clicked on new dashboard, the create a new dashboard screen will appear. Give your dashboard a name, select users who can access it and users who can edit it. You can also customize the dashboard's color. Once you have created the dashboard, you have to add widgets to it now. Widgets are charts or tables that can display metrics from ApiOmat Studio. A widget can access data from a single app or compare up to 3 apps. If you have edit rights to the dashboard, you can edit or delete widgets in the dashboard by over a widget and clicking on the three dots that appear in the widget's upper right hand corner.